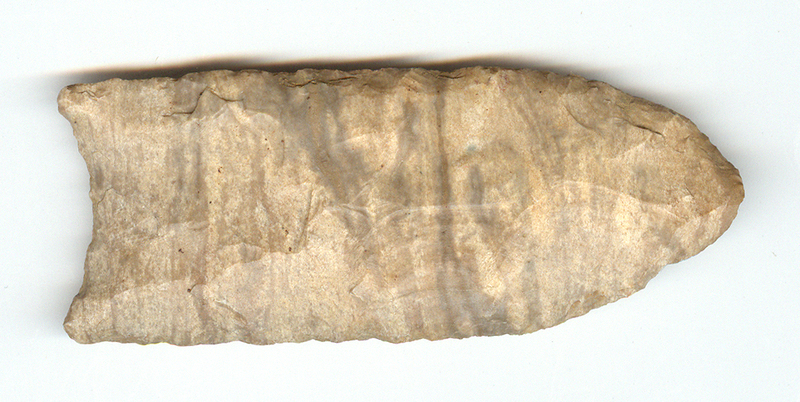 A Large Size, Heavily Used, Well Made, Clovis Point That Exhibits Surface Oxidation & Stone Aging Coloration Type Patina, Correct Early Style Flaking, Aged Soil Deposits, Correct Rolled Basal Edge Dulling, Aged Mineral Deposits, Overall Polished Blade Use Wear, Correct Style Fluting, Correct Material And Manufacture For The Area Found. Ex-Peter Jenson Collection. Visible Aged Blade Use Sharpening Has Reduced The Length Somewhat, Displaying Heavy Tip Reduction Ancient Use Wear! Includes Jim Bennett (# 82F5R75, 6-19-12 ), T&T Archaeological Consulting ( Tony Putty ) And Ken Partain Certificates Of Authenticity!